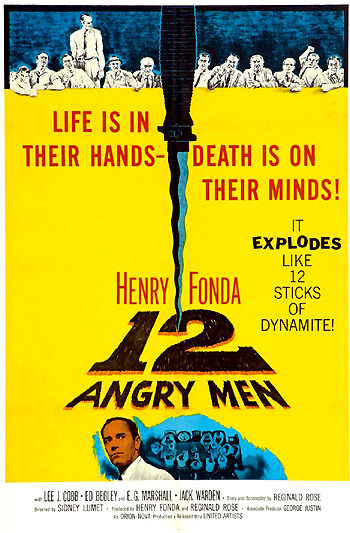 12 Angry Men (1957), or Twelve Angry Men (1957), is the gripping, penetrating, and engrossing examination of a diverse group of twelve jurors (all male, mostly middle-aged, white, and generally of middle-class status) who are uncomfortably brought together to deliberate after hearing the 'facts' in a seemingly open-and-shut murder trial case. They retire to a jury room to do their civic duty and serve up a just verdict for the indigent minority defendant (with a criminal record) whose life is in the balance. The film is a powerful indictment, denouncement and expose of the trial by jury system. The frightened, teenaged defendant is on trial, as well as the jury and the American judicial system with its purported sense of infallibility, fairness and lack of bias. "LIFE IS IN THEIR HANDS - DEATH IS ON THEIR MINDS! It EXPLODES Like 12 Sticks of Dynamite." This was live television-trained director Sidney Lumet's first feature film - a low-budget ($350,000) film shot in only 19 days from a screenplay by Reginald Rose, who based his script on his own teleplay of the same name. After the initial airing of the TV play in early 1954 on Studio One CBS-TV, co-producer/star Henry Fonda asked Rose in 1956 if the teleplay could be expanded to feature-film length (similar to what occurred to Paddy Chayefsky's TV play Marty (1955)), and they became co-producers for the project (Fonda's sole instance of film production). The jury of twelve 'angry men,' entrusted with the power to send an uneducated, teenaged Puerto Rican, tenement-dwelling boy to the electric chair for killing his father with a switchblade knife, are literally locked into a small, claustrophobic rectangular jury room on a stifling hot summer day until they come up with a unanimous decision - either guilty or not guilty. The compelling, provocative film examines the twelve men's deep-seated personal prejudices, perceptual biases and weaknesses, indifference, anger, personalities, unreliable judgments, cultural differences, ignorance and fears, that threaten to taint their decision-making abilities, cause them to ignore the real issues in the case, and potentially lead them to a miscarriage of justice. Fortunately, one brave dissenting juror votes 'not guilty' at the start of the deliberations because of his reasonable doubt. Persistently and persuasively, he forces the other men to slowly reconsider and review the shaky case (and eyewitness testimony) against the endangered defendant. He also chastises the system for giving the unfortunate defendant an inept 'court-appointed' public defense lawyer who "resented being appointed" - a case with "no money, no glory, not even much chance of winning" - and who inadequately cross-examined the witnesses. Heated discussions, the formation of alliances, the frequent re-evaluation and changing of opinions, votes and certainties, and the revelation of personal experiences, insults and outbursts fill the jury room. This classic, black and white film has been accused of being stagey, static and dialogue-laden. It has no flashbacks, narration, or subtitles. The camera is essentially locked in the enclosed room with the deliberating jurors for 90 of the film's 95 minutes, and the film is basically shot in real-time in an actual jury room. Cinematographer Boris Kaufman, who had already demonstrated his on-location film-making skill in Elia Kazan's On the Waterfront (1954) in Hoboken, and Baby Doll (1956) in Mississippi, uses diverse camera angles (a few dramatic, grotesque closeups and mostly well-composed medium-shots) to illuminate and energize the film's cramped proceedings. Except for Henry Fonda, the ensemble character actors were chosen for their experience in the burgeoning art of television. The film was a financial disaster when it first opened (during a time of colorful widescreen film offerings), but it did receive three Academy Award nominations (with no wins): Best Picture, Best Director, and Best Adapted Screenplay. All three categories lost to David Lean's Oscar-sweeping, extravagant epic film The Bridge on the River Kwai. Henry Fonda's central role as a juror with resolute caution was un-nominated as Best Actor. None of the jurors are named, and they don't formally introduce themselves to each other (except for two of them in the final brief ending). Jurors are labeled with numbers based on their jury numbers and seats at a conference table in the jury room (in clock-wise order). The film opens with the camera looking up at the imposing pillars of justice outside Manhattan's Court of General Sessions on a summer afternoon. The subjective camera wanders about inside the marbled interior rotunda and hallways, and on the second floor haphazardly makes its way into a double-doored room marked 228. There, a bored-sounding, non-committal judge (Rudy Bond) wearily instructs the twelve-man jury to begin their deliberations after listening to six days of a "long and complex case of murder in the first degree." He admonishes them that it is a case involving the serious charge of pre-meditated murder with a mandatory death sentence upon a guilty verdict, and now it is the jury's duty to "separate the facts from the fancy" because "one man is dead" and "another man's life is at stake." If there's a reasonable doubt in your minds as to the guilt of the accused, a reasonable doubt, then you must bring me a verdict of not guilty. If however, there is no reasonable doubt, then you must in good conscience find the accused guilty. However you decide, your verdict must be unanimous. In the event that you find the accused guilty, the bench will not entertain a recommendation for mercy. The death sentence is mandatory in this case. You are faced with a grave responsibility. Thank you, gentlemen. As the jury leaves the box and retires to the jury room to deliberate, the camera presents a side-view and then a lingering, silent closeup of the innocent-faced, frightened, despondent slum boy defendant with round, sad brown eyes. [His ethnicity, whether he's Puerto Rican or Hispanic, is unspecified.] The plaintiff musical theme of the film (a solo flute tune by Kenyon Hopkins) plays as the claustrophobic, bare-walled, stark jury room (with a water cooler in the corner and a dysfunctional mounted wall fan) dissolves into view - and the credits are reviewed.